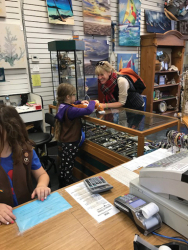 Excited and enthusiastic Brownie Girl Scouts from Troop #2592 visited our store to work toward earning their badge in Philanthropy. We welcomed nine seven-year-olds who all came ready to learn. Philanthropy is a difficult word to say, but they learned what it means. We discussed the difference between a want and a need. Since they all brought donations, we talked about how they decided what would be the best things to contribute. They toured the store and learned how the resale store supports Assistance League philanthropic programs that benefit children in the Santa Clarita Valley. We told them about Operation School Bell®, which provides new school clothes and shoes to students in need, and iCare for Kids, which provides free eye examinations and eyeglasses to children who are identified as needing them. The highlight of the afternoon was the opportunity for the Brownies to help with the hands-on project of dressing teddy bears in the special tee shirt of our Teddy Bear Patrol program. The girls dressed many bears and know that those bears will become an item of comfort to children in traumatic situations. The bears are ready to be placed in first-responder vehicles, Henry Mayo Newhall Hospital Emergency Room and other agencies in the Santa Clarita Valley. The girls ended the day with a little shopping because that is what one enjoys doing in our well-stocked store. Many bought things to take home as a surprise for their family members. Members of Troop #2592 will proudly wear their Philanthropy badges, and members of Assistance League Santa Clarita hope that they have inspired these happy young Brownies by letting them experience some of the joy that comes from helping others. For more information about Assistance League Resale and our philanthropic programs, please visit our website, www.assistanceleaguesantaclarita.org.